The Great British Spring Clean – organised by Keep Britain Tidy takes place between 23rd March and 22nd April. Gateacre's contribution will be a clean-up of the village centre, and the pavements leading out of it, organised by the Friends of Gateacre. Meet on the village green (Grange Lane/Gateacre Brow) ready for a 10.00am start, on Saturday 6th April. For more information and to register for this clean-up, click here. On Thursday 28th March from 6.00pm-9.30pm at St Michael's Church, Liverpool Friends of the Earth and Friends of the Earth host a forum on Climate Change, '12 years To Save The Planet' with speakers including Craig Bennett (CEO Friend of the Earth EWNI), Natalie Bennett (Green Party) and Professor Andy Morse (Liverpool University). On Monday 11th March from 10.30am-12.30pm, Halton and St Helens Voluntary and Community Action host a 'Meet the Funder' event with Anna Simmon from The National Lottery Community Fund who is the Funding Officer for both Cheshire and Merseyside. During this morning session you will get the opportuntiy to hear all about the opportunities that The National Lottery Community Fund offer with a particular emphasis on their Reaching Communities Programme. In addition to hearing from The Big Lottery Fund we will also have the Halton Borough Council's External Funding Team available to offer any further support in developing your applications. Tomorrow from 2.00pm-5.00pm at 502, Lecture Theatre 3, next to the Liverpool Guild of Students, Merseyside Recycling and Waste Authority, the University of Liverpool and the Liverpool Guild of Students in partnership with the Circular Economy Club Liverpool City Region are hosting a screening of ‘CLOSING THE LOOP’, the world’s first feature-length documentary film about the circular economy. The documentary provides a range of examples and insights for our global society and the environment including what we make, buy, consume, throw away, recycle and reuse. Its’ stark comments about the current global and resource intensive economy are a timely reminder that many of these resources are finite. The themes include the impact of economies that are predominantly still linear, how unsustainable these are on both resources and people, and looks at progressive projects that demonstrate innovative resource management. The film also advocates how an economy can be moved to a more circular approach through meaningful change, and advocates designing out waste in the first place. By keeping resources at their highest value for longer, the film will provoke solutions to the problems we, and the generations ahead will face imminently and in the future. Following the screening, you will be able to put questions to our panelists and have the opportunity to join the Circular Economy Club Liverpool City Region. On Thursday 28th February from 10.00am-3.00pm at Risley Moss Local Nature Reserve in Birchwood, the Community Forest Trust present the North West Forest Forum. The forum will look at Woodland Management and the pilot work that Cheshire West and Chester is delivering, looking at whole estate level management. The Forum will also look at future funding and support for forestry and the research underay in Liverpool for the Urban GreenUP project. For more information on the Forum including the full programme, click here. On the 18th February, Redeeming Our Communities, a charity with the aim of bringing about community transformation by creating strategic partnerships which open up opportunities for crime and disorder reduction and improved community cohesion will host a free Conversation Event. On Monday 18th February from 7.00pm-9.00pm at The Bridge Suite at Halton Stadium, will be the Redeeming Our Communities Conversation Widnes. For more information on these Events and to register, click here. On Tuesday 22nd January from 5.30pm at RIBA North, Merseyside Civic Society present 'A "Mersey Waters" Update: Two Megaprojects for Liverpool and Wirral.' The event will feature an update on recent and future proposals for both sides of the river from two speakers involved in the immediate and long-term plans for these proposals, Richard Mawdsley and Pete Swift. For more information, including on how to book, click here. On the 21st January from 12.15pm-5.00pm, the Institute of Chartered Foresters, the Mersey Forest and the Royal Institution of Chartered Surveyors (RICS) present 'Creating value from Woodland - new opportunities in the Northern Forest.' This is a great opportunity for professional foresters and rural surveyors, land agents and land owners, to get together and take a fresh look at where woodland could be adding value. For a full list of speakers and to book your ticket, click here. On Tuesday 4th December, St Helens Council and The Forestry Commission present 'A Vision for St Helens' Parks and Green Spaces at the St Helens Town Hall. There are two free sessions planned, one from 2.00-4.00pm and the second from 6.00-8.00pm. Each session will follow the same format, with presentations to provide the context and then an opportunity to have your say about parks and greenspaces in small groups - so everyone will have a chance to contribute. 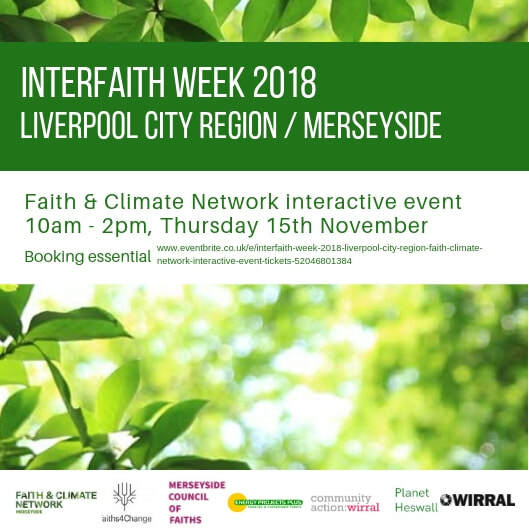 On Thursday 15th November, Community Action Wirral are working with Faiths 4 Change to promote the 'Faith & Climate Change: Sharing Actions, Advice and Practical Support on Energy' event. The event will be held 10.00am - 2.00pm at Wirral Deen Centre in Birkenhead and will include refreshments and lunch and is free to attend. Booking is essential with details on how to book being found on the flyer below. On Wednesday 31st October and Thursday 1st November, UN-Habitat and Liverpool Vision will host a two-day conference with overarching theme of the summit is ‘Better City, Better Life’ with the sub-theme of ‘Building Sustainable and Resilient Cities’ as a part of World Cities Day. A dynamic mixture of panel sessions, presentations and seminars from international city representatives will come together in Liverpool’s Grade l St George’s Hall to share their latest urbanisation success. The event will also provide opportunities for cities to equip themselves with the tools required to make their city more resilient in the future.The evening drinks reception and formal dinner will be held at Liverpool’s world-renowned Anglican Cathedral and the event’s final day will culminate with a tour of Liverpool City Region’s most resilient and sustainable urban areas. To register your interest in this Conference, click here. Engage Liverpool are hosting three seminars across October 2018 looking at the inspiring experiences of 3 European UNESCO Cities – Strasbourg, Hamburg and Bordeaux and how UNESCO status can benefit our own port city. The city authorities of Strasbourg, Hamburg and Bordeaux are leading the way in making the best possible use of their special status as UNESCO cities to enhance their regeneration and development and actually set their cities apart from others creating something unique and distinct, adding value to their citizens experience of living and working in the city. Taking place in the Three Graces, these events will also provide access to some of Liverpool’s iconic buildings not usually open to city centre residents, combining the celebration Liverpool’s world famous architecture whilst encouraging discussion around the future of our city. On Tuesday 23rd October from 6.00pm-8.30pm at RIBA North, Merseyside Civic Society present 'Making Our City Region a More Liveable Place: Improving Opportunities for People and Movement in Everyday Places' with John Smith, Programme Development Officer at the LCR Combined Authority. The presentation will introduce two major transportation policy statements on a Local Journeys Strategy and the Rights of Way Improvement Plan recently agreed by theLCR Combined Authority. Both are designed to make a deliver a more people-centred and partnership approach to placemaking across the Liverpool City Region. There will be a look ahead to the Local Cycling and Walking Infrastructure Plan currently in preparation. On Thursday 18th October from 9.30am-4.00pm at Bluebell Park School in Knowsley, The Mersey Forest present the Green Learning Environments Conference. Green Learning Environments is a project funded by Erasmus+. They are working with environmental partners and schools for children with special needs in the UK, Belgium and Slovenia. Over the past two years they have collated examples of good practice, such as Forest School, developed new teaching tools and spoken to experts in SEN education and outdoor learning. The conference is an opportunity for to share what they have learnt, explore what opportunities there are to develop the work further and see if they can develop a network of practitioners and schools who wish to work together in the future. For more information on this Workshop, including how to book, click here. On Monday 24th September from 9.30am-3.00pm at the Totally Wicked Stadium in St Helens, Halton and St Helens Voluntary and Community Action present their AGM and annual conference “Social innovation – Doing things differently in Halton & St Helens”. The conference will include talks from Jackie Le Fevre, Values Expert on the importance of values for innovation and thinking differently and Mark Swift, Wellbeing Enterprises CIC Ltd on social innovations and their potential to empower communities and transform public services. Afternoon workshops will focus on “Social Pioneering – navigating something new.” Finally, they have invited a range of local funders and support organisations for a marketplace that will provide a number of opportunities to get information and talk to them about work and projects. Develop and deliver resource management projects that will create a region where we reduce what we throw away, retain value and create employment in this growing part of the economy. Support to deliver cost effective, sustainable products and services and maximise your organisation’s triple bottom line by more efficient use of resources. Access to circular economy experts and best practice locally and globally. Help to drive the implementation of the circular economy, and a collaborative and innovative approach to competitiveness and job creation in our City Region. For more information on this workshop and to book, click here. CPRE Lancashire are hosting a public meeting about planning a green future for the Liverpool City Region at 10.00am – 12.30pm on Thursday 19th July, at the Quaker Meeting House, 22 School Lane, Liverpool, L1 3BT. Tickets are free but booking is essential. CPRE will be joined by the Mayoral Advisor on the natural environment Gideon Ben-Tovim and others for discussions covering the city region’s Spatial Development Strategy, CPRE’s new brownfield registers toolkit for LCR, and a review of the city region’s environmental priorities and steps necessary to achieve them. 5.00pm - 8.00pm - Party time! On Thursday 14th June from 9.30am-3.00pm at the Quaker Meeting House, Campaign Bootcamp have teamed up with the Clean Air Parents’ Network to provide a free training campaign entitled 'Let's make air quality better in Liverpool'. On the day you’ll meet other people who want to campaign for clean air and together you'll learn what a campaign is, why clean air matters, how to build a campaign and most importantly how to win your campaign! For more information on the Training, click here. From Monday the 11th to Sunday the 17th June at Tate Exchange Liverpool, 'Made From Light: The Art and Science of Renewable Technology' takes place. You are invited to be a part of a week-long programme on the art, science and history of renewable energy curated by researchers from the University of Liverpool. The week will comprise of a series of public talks and creative workshops, and an exhibition of University of Liverpool research. For the Tate listing of the week, click here. For the Liverpool University listing of the week, click here. On Wednesday 6th June from 5.00pm-7.30pm at the Marriott Hotel Liverpool, Liverpool and Sefton Chambers of Commerce host a summer celebration charity networking event. The event is designed to to recognise all the fantastic work charities do across the city region and allows the opportunity to network with colleagues over drinks and a bbq on the terrace with entertainment from The BIG Event Group. Community Action Wirral are hosting a 'Volunteer Thank You' event on Tuesday 5th June from 10.30am-12.30pm at Birkenhead Town Hall. New Mayor Cllr Geoff Watt and Mayoress Anne Watt will be there to say thank you for all of those who give up their free time and energy to volunteer. To register for a place please email northwestfoe@foe.co.uk with your name, email, details of any local planning campaigns you are involved in, and any dietary and access requirements. To book your Free Ticket to this event, click here. On Wednesday 16th May from 6.30pm-8.30pm at the Anglican Cathedral, Merseyside Civic Society present an event 'How do we build more social value into the Liverpool City Region?' Rev Canon Dr Ellen Loudon and Professor Erik Bichard discuss how the promotion of social value should be part of a stronger social economy, public procurement, and planning in the form of a new Sustainable Urban Development Strategy. DoES has moved to a new venue, so their next group meeting at 6.30pm on Wednesday 18th April, will be in The Tapestry building at 68-76 Kempston, St L3 8HL. DoES Liverpool is a community of makers, designers, coders, engineers, and many others who together make up one of the most active and dynamic groups in Liverpool. Knowsley Community and Voluntary Services present two workshops over the coming weeks. Firstly, on Wednesday 18th April from 10.00am-1.00pm, Neil Morran and Lydia Bates from Defnet Media lead a GDPR Workshop, covering what the new data protection regulations are, how GDPR is different from current data protection legislation, why GDPR is important to your organisation, and the people you support and what your organisation needs to do. Then, on Wednesday 2nd May from 10.00am-4.00pm KCVS and funding expert Peter Riley lead a Big Lottery Reaching Communities Workshop, covering understanding the new application process, how to involve your beneficiaries, what is meant by Evidence of Need, understanding BIG’s Priorities and how to deliver them and much more. Following feedback from the last Knowsley Better Together Event, Knowsley Community and Voluntary Services are committed to providing more support for organisations to maximise their opportunities for funding. On March 21st from 10.00am-1.00pm, they present a small grants workshop to help you identify and choose the right funds, find out what the funder is really looking for and examine the importance of measuring your success. Be The Change is the positive litter solution education programme and award scheme from Surfers Against Sewage and the Greggs Foundation. Be The Change encourages students to recognise that they have a leading role to play in tackling the litter crisis, while inspiring and empowering them to create and deliver new solutions to protect the places they love. The tour will reach Liverpool on 12th March. For more information about Be the Change, click here. On Tuesday 6th March at Riba North, Mann Island, Liverpool City Region Local Enterprise Partnership host two energy strategy workshops. The first, from 9.30am to 12.00pm is aimed at public sector representatives and academics, with the second, from 1.00pm to 3.30pm aimed at businesses and third sector representatives.An Energy Strategy and Road Map is presently being drafted. The strategy will ultimately be adopted as guidance by the City Region Mayor, Combined Authority and partner organisations. These workshops take place at the midpoint of work and will preview initial findings and recommendations. The audience will be invited to contribute to through a Q&A and thematic discussions. For more information on the Public Sector and Academics Workshop, click here. For more information on the Business and Third Sector Workshop, click here. On Wednesday 28th February from 9.30am-1.00pm at Halton & St Helens VCA, St Maries, Widnes, NHS Cheshire & Merseyside Partnership (STP) are planning the next third sector meeting. It is planned that reps from regional planning in health will be present to support their understanding of the value of the third sector to the health outcomes detailed in the STP plans. To help focus the event they will plan the agenda for a dragon’s den style event to demonstrate the value of the community and voluntary sector to health goals such as prevention, supporting and developing out of hospital care and mental health and wellbeing. On Monday 26th February at the Cunard Building from 5.00pm-7.30pm, Merseyside Civic Society present a talk on the new Liverpool Local Plan. Mike Eccles, Planning Policy Coordinator, Liverpool City Council, will explain the process and answer your questions. Capacity of the venue is limited to 60. If you wish to attend, booking is advised. Next Tuesday (30th) from 2.30pm-4.30pm at the Treasure Theatre in the World Museum, North Liverpool Creative Connections presents, 'The Green Roof Man: Docking Stations for Urban Wildlife' with John Little. John will share his experience of building and maintaining green roofs, habitat walls, sand/bee planters, of using construction waste to shape plant communities on brownfield sites. John will also speak about how best to work with the public sector, such as with highways and grounds contracts to ensure that maintenance plans can sustain and enhance people's experience of nature in cities. On Monday 22nd January from 1.00pm-4.00pm at The Lauries, Birkenhead, Community Action Wirral hold a Wirral Volunteer Managers Network Meeting. This meeting gives people working with volunteers in Wirral an opportunity to share ideas, network and provide mutual support. For more information on the Network Meeting, click here. 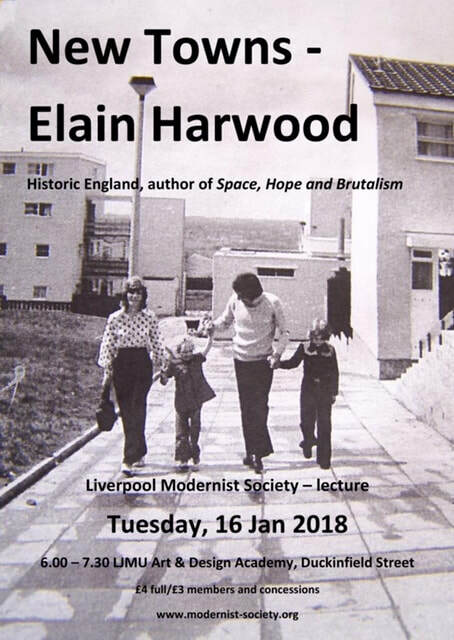 On Tuesday 16th January from 6.00pm-7.30pm at LJMU Art & Design Academy, Liverpool Modernist Society present a lecture by Elain Harwood of Historic England titled 'New Towns'. Considering the close promximity of the New Towns Runcorn and Skelmersdale, this topic has a lot of local resonance. For more information on the Lecture see the flyer below. Knowsley Better Together is a partnership event between Knowsley CVS and Knowsley Council with voluntary, charity, faith and social enterprise organisations active in the borough of Knowsley invited to join. Held at The Venue (Signature Room), Civic Way, Huyton, L36 9GD between 10.00am and 12.00 on Tuesday 16th January, this event is the 5th in a series of meetings to promote and enable cross sector collaborations in Knowsley. Following the meeting, a Funders Fair and Knowsley Soup will take place. On Tuesday 21st November from 6.30pm at the Quaker Meeting House on School Lane, Merseyside Civic Society present their Annual General Meeting. This meeting will be chaired by the MCS Chair Jean Grant and will be followed by a presentation by The Lord Mayor of Liverpool, Councillor Malcolm Kennedy. The Lord Mayor of Liverpool, Councillor Malcolm Kennedy, a Tyneside boy with 40 years in Liverpool formerly cabinet member for regeneration, will give his unique view of Liverpool’s regeneration and our Future within the City region and the Northern Powerhouse, plus the presentation of 3rd Rita Cheesman Heritage Interpretation award. All are welcome to attend this open meeting. For more information on the Workshop, including how to secure tickets, click here. From 16th-19th October at the Floral Pavilion Theatre and Conference Centre, New Brighton, Wirral, the World Urban Parks European Congress 2017 takes place. The 2017 Congress takes place on the Wirral as part of its celebrations for the 170th anniversary of the opening of Birkenhead Park in 1847 that subsequently influenced the design of Central Park in New York. This year's congress theme Landscapes Alive: Community, Sustainability and Heritage will explore key issues around the crucial role of parks for towns and cities; the challenge of sustainability; and a celebration of the rich heritage parks create within communities. The keynote speaker will be Douglas Blonksy, President & CEO of Central Park, New York. On Saturday 14th October from 9.30am-4.30pm at the Quaker Meeting House, School Lane, Liverpool, 'Just Do It' A Transition Liverpool Symposium will take place. Transition Liverpool welcome you all to spend the day considering next steps on our journey towards a cleaner, healthier, fairier city and celebrating ways we're already doing it. Those new to Transition and seasoned travellers alike are invited to attend a day of informative and interactive talks, workshops and activities. For more information on the days events and to register, click here. On Thursday 12th October from 3.00pm-5.00pm at the University of Liverpool a workshop 'Guidance for More Effective Strategic Environmental Assessment will take place, led by Prof Marcelo Montano (University of Sao Paulo) and Prof Thomas Fischer (University of Liverpool). Guidance can play an important role in supporting effective strategic environmental assessment (SEA). In this context, guidance representing best practice is usually associated with going beyond simple legal compliance. As experience, skills and knowledge are continuously developing, guidance needs to be reviewed and updated regularly, therefore requiring a certain degree of flexibility. SEA practitioners are conscious of limitations associated with the guidance they use. However, the threat of legal challenges and fear for litigation increases an inflexible approach to SEA. Whilst methods and procedures are key issues in most guidance, there’s currently an unexplored universe related to the integration of SEA into the planning process and into a tiered PPP system. Overall, SEA guidance needs to be approached as a dynamic element in non-static SEA systems. The main aim of this two hour workshop is to start a debate on how SEA guidance needs to be approached and developed in order to effectively support good quality SEA. Please send an email either to Marcelo Montano minduim@sc.usp.br or Thomas Fischer fischer@liverpool.ac.uk to confirm your attendance. On Tuesday 10th October from 10.00am-12.00pm at The Venue in Huyton, Knowsley Community & Voluntary Services invite you to an event, Knowsley Better Together. Voluntary, charity, faith and social enterprise organisations active in the borough of Knowsley are all invited to join. This event is the 4th in a series of meetings to promote and enable cross sector collaborations in Knowsley. Knowsley Better Together is a partnership event between Knowsley CVS and Knowsley Council. The event will be attended by Cllr Andy Moorhead (Leader of KMBC) with senior commissioners and decision makers in Knowsley Council also in attendance. Engage 2017 Seminar Series - Liverpool UNESCO World Heritage Site – A Status worth fighting for? On Thursday 28th September from 6pm at RIBA North, Merseyside Civic Society present Donald K Carter: The Story of Pittsburgh and Remaking Post-Industrial Cities. Don Carter will be giving a talk about urban regeneration in Pittsburgh, the similarities and differences between Liverpool and what happened in the United States in the late 1980s. The doors will open at 6pm before the talk ‘The Story of Pittsburgh and Remaking Post-Industrial Cities’ starts at 6.30pm. The 40 minute talk will be an interactive multi-media experience with both sound and visuals helping Carter to describe the unique perspective he had on the regeneration of Pittsburgh and the work that he did to improve the area. Carter’s initial talk will be followed by a short discussion with Erik Bichard who wrote Liverpool’s Case Study within ‘Remaking Post-Industrial Cities’, the pair will discuss the writing process that they went through when constructing and assembling the book and the interest of having many voices giving examples and discussing an overarching topic. Don Carter and Erik Bichard will then take questions and answers from the audience whilst offering views on Liverpool’s unsure Unesco status as site of World Heritage. You can book onto the event here. On Thursday 14th September from 9.00am until 4.00pm at Liverpool Hope University, Teacher Education for Equity and Sustainability (TEESNet) present their 10th annual conference. The conference will explore the theme of quality education in relation to ESD/GCE in Teacher Education and schools, and what this means in divergent local, national and global contexts. It will also consider the opportunities presented by the SDGs for a holistic vision of education. This event builds on the successful 2016 TEESNet conference on monitoring and evaluation of ESD/GCE attended by over 80 teachers, headteachers, policy makers and researchers from the UK and beyond. Liverpool Lime Street station is receiving its biggest upgrade since the 19th century. This work will enable an extra three services per hour in and out of Lime Street station, including new direct services to Scotland. Longer, better managed platforms will allow bigger trains, with more room for passengers into the station. In order to complete the first phase of work between 30 September – 22 October 2017, there will be changes to journeys through Liverpool Lime Street station. Network Rail have put plans in place, so you can still get from A to B, with a couple of simple changes to your journey. Liverpool & Sefton Chambers of Commerce and the Liverpool BID Company, in partnership with Merseytravel and Network Rail, have organised a briefing event on Thursday 14 September (9.00am to 10.am including refreshments) to provide information about the changes to your journey. To make sure you understand the full impact of the changes on your business during this period join us for this free events at Liverpool & Sefton Chambers of Commerce, One Old Hall Street, Liverpool L3 9HG. On Wednesday 19th July from 6.00pm-8.30pm at Metal at Edge Hill Station, Metal host Paris based organisation, Paléo Energétique for a special edition Future Station event. Paléo Energétique is an open source, collaborative research project investigating sustainable energy inventions that history has forgotten. Paléo Energétique will give a public presentation of their research and projects, broadening our understanding of historic and present day sustainable energy technologies and innovations.The evening will include an open discussion exploring how arts led activity can stimulate innovative responses around the renewable energy and sustainability agenda in our surrounding area. If you are interested in gardening or would like to be involved with the Broadgreen Garden Project come along to the Broadgreen Hospital Foyer on Tuesday 18th July 11am-2pm. For more information, see the flyer below. On Wednesday 5th July from 1.00pm-3.00pm at Everton Park Nature Garden, The Wildlife Trust present the Liverpool Forest School Launch Event. Forest Schools has already been successful in creating outdoor classrooms for children, teachers and parents in Manchester – and is expanding into Liverpool, thanks to players of the People’s Postcode Lottery. The day will consist of a carousel of Forest School activities run by Lancashire Wildlife Trust Forest School Practitioners, with four local schools involved in the project attending. They will be showcasing newly installed Forest School outdoor educational facilities on the site, as well as networking with other local community groups and organisations involved in the project. For more information on the Launch Event, click here. On Wednesday 5th July from 10.00am-3.45pm at Manchester Metropolitan University , the North West Active Travel Network present their seventh regional seminar 'Improving Consultation and Engagement - Managing Change, Reducing Conflict'. This event features talks, workshops and feedback sessions throught the day. On Wednesday 5th July from 10.00am to 3.00pm, Halton and St Helens Voluntary and Community Action present their Annual Conference for 2017. The conference will offer the sector the opportunity to listen to keynote speakers, meet various funders, access workshops along with the opportunity for networking. Places on the conference are limited due to the size of the venue so book as soon as you can via their website. For more information on the conference, including the full programme, click here. On Thursday 29th June from 8.00am-9.30am the Liverpool City Region Local Growth Hub present the Local Hub Growth Breakfast: Growing your renewable energy supply chain. The Local Growth Hub, in association with Brabners Renewable Energy Team and LCR Future Energy, is inviting businesses from across the Liverpool City Region to join them to discuss the national and global potential of this rapidly growing sector and giving an insight into how businesses can access these markets. Attendees will also find out how to unlock support available through LCR Future Energy programme, the new £3.7m initiative, funded by the European Regional Development Fund (ERDF), to help SMEs across the across the Liverpool. For more information on the Hub Breakfast, click here. The event is aimed at Businesses, Academia, Local Government and Civil Society-NGOs. On Wednesday 21st June from sunrise (4.00am) until sunset (11.00pm) at Princes Park in Liverpool, Squash Nutrition host the annual summer solstice community gathering. On this special, longest day of the year they welcome everyone to come and do their thing. Pop in or stay a while at this free, midsummer's day celebration anytime from dawn till dusk, whatever the weather! For more information on the activities throught the day, click here. On Saturday June 17th from 11.00am-4.00pm at The Bluecoat, School Lane, Liverpool, Merseyside Civic Society in partnership with Bluecoat announces their free annual examination of the State of the City in 2017. This year the focus will be on examining one of our most important resources, the ability to create strong communities. For more information on the event, including a full programme of the day, click here. On Wednesday 14th June from 9.30am-4.00pm at the University of Liverpool, IAIA Ireland-UK Branch present a workshop discussing the ramifications of UK exit from the European Union on environmental assessment (EIA, SEA and other IA tools) practice in the country. Discussion will cover the contributions of EIA and SEA, a review of SWOT from 25 years of EIA practice, the successes and failures of SEA and critical reflection on effectiveness in the UK and the future of environmental assessment post-Brexit. Speakers and contributors include John Glasson (Emeritus Professor, Oxford Brookes University), Thomas Fischer (EAM Research Centre, University of Liverpool), Urmila Jha Thakur (University of Liverpool), Riki Therivel (Levett-Therivel and Oxford Brookes University), Rufus Howard (Royal HaskoningDHV), Bill Sheate (Collingwood Environmental Planning), Josh Fothergill (IEMA and Director, Fothergill Training & Consulting Ltd), Alan Bond (University of East Anglia), Ben Cave (Ben Cave Associates), Bridget Durning (Oxford Brookes University), Angie Jukes (Stockport Council), Phil Le Gouais (Mott MacDonald) and Olivier Sykes (University of Liverpool). On Thursday 1st June from 8.30am-10.30am at The Old Hall, Cotton Exchange, Bixteth Street, Liverpool, award winning digital agency Mashbo will be holding a seminar designed to help charitable and third sector organisations get the most out of their digital strategies. During this event, the Mashbo team will give you an insight into how to plan, budget and deliver successful results for your digital campaigns. For more information on the event, including how to register for tickets, click here. On Thursday 18th May from 9.30am-4.30pm at Mann Island, Liverpool, Zero Carbon Liverpool present a Sustainable Business Workshop. This day of presentations and workshops will be of interest to any local businesses seeking to do more to engage with the green agenda, whether they are just beginning to consider their options or are looking for a new approach to compliment current activity. This workshop will provide attendees with a range of options to act on business energy and environmental issues, empowering them by looking at the wider context, whilst also providing examples of incremental first steps that any business can take. On Monday 15th May from 6.00pm to 8.00pm at the Victoria Gallery & Museum on Ashton Street, The University of Liverpool present The Low Carbon Liverpool Debate. This debate will feature civic figures, practitioners and senior decision makers being involved in an informed, evidence-based discussion. On Saturday 13th May from 11.00am-5.00pm at Rice Lane City Farm in Walton, Merseyside Civic Society present their latest Civic Saturday. Maria Hornsby will introduce the farm and inform on her many years of experience as an urban agriculturalist and international champion of urban farming. Events of the day will be held in the beautiful base camp of the chapel that has been recently refurbished and offer a fantastic meeting point for groups to congregate in when not exploring the sites of the beautiful farmland. For more information on the events of the day, click here. On Tuesday 9th May from 9.30am to 1.00pm at the Redmonds Building, Brownlow Hill, Liverpool, The Mersey Forest presents a Natural Health Service Conference. The Natural Health Service focuses on how we use the natural environment as a health asset. The Conference will feature speakers Professor Greg Whyte OBE and Dr Gina Radford, Deputy Chief Medical Officer who will present on the national and internal national context. Pioneering delivery partners will showcase their approach, challenges and achievements, and provide practical resources for commissioners and practitioners to develop the Natural Health Service in their locality. There will be discussions exploring how health inequalities can be addressed in a cost-effective way using the benefits of the Natural Health Service and how the impact and outcomes can be measured and evaluated. For more information on how to attend the Conference, click here. Halton & St Helens Voluntary and Community Action have made us aware of Halton Borough Council’s External Funding Team holding a Meet the Funder Event on Wednesday 3rd May from 10.00am to 12.00pm at the Council Chamber at Runcorn Town Hall, Heath Road, Runcorn. The funder is the Big Lottery Fund Awards for All Event who will be talking about their Awards for All grant scheme. This funds grants of up to £10,000 for a range of activities. The event will consist of a presentation by Connor Cross, Big Lottery Fund’s Local Regional Officer, who will explain the Awards for All Fund and how it works, as well speak to the Council’s External Funding, Sports and Community Development Teams. On Tuesday 2nd May from 12:30pm to 1:00pm starting at Exchange Flags (Behind The Town Hall), the Liverpool BID Company present Net-Walking Lunch - with Health@Work. Every two weeks the Commercial District BID and Health@Work join forces to give you a fun reason to get out of the office. The 30 minute lunchtime walks give you the chance to network with other employees, stay healthy and explore parts of the district you didn't know about. For more information on the walk, click here. Compass Merseyside have released the details of an event leading up to the election of a new Metro Mayor in May 2017. This event will be assessing the prospects, the opportunities and the challenges that lay ahead for the Liverpool City Region. On Thursday 27th April from 11.00am to 3.00pm at Rice Lane City Farm, Urbanag CIC will hold an open day. There will be tours of the site and explanations on Aquaponics and information on the various free courses offered by Urbanag CIC. The Urbanag team will be there to give an introduction to the world of engineering, and uses aquaponics to teach engineering principles. Aquaponics is a method of producing food that is well suited to the urban environment. It produces fish and vegetables without needing soil, or even much space. Phone: John Smith on 07948372821. On Thursday 27th April from 9:30am to 12:00pm at The Cunard Building, The Carbon Trust present the Green Business Fund Workshop (Liverpool) - An Introduction to Energy Efficiency for SMES. The Carbon Trust Green Business Fund is a brand new energy efficiency support service for small and medium-sized companies. It provides direct funded support through energy assessments, training workshops, equipment procurement support and up to £10,000 capital contribution towards your energy saving equipment purchase. The two-hour workshops will help small companies across England learn how to identify and implement opportunities to reduce energy costs within their business and make the most of the Fund. Liverpool City Region Metro Mayor - Young People - 12th April from 1.00pm-3.00pm at Liverpool Town Hall, organised by Youth Focus NW Ltd.
On Friday 7th April from 7.00pm-9.30pm at The Brink on Parr St, Liverpool, Zero Carbon Liverpool host their launch night, featuring a musical performance 'The Incredible Story of Carbon'. After an introduction to Zero Carbon Liverpool via a project presentation, the musical performance will be a spoken word story-telling, accompanied with live piano and visuals lasting about an hour. The event will conclude with responses, reflections and questions. Liverpool City Region Metro Mayor - Communities and the Voluntary Sector - 6th April from 5.30pm-8.30pm at Liverpool Cathedral, organised by VS6. 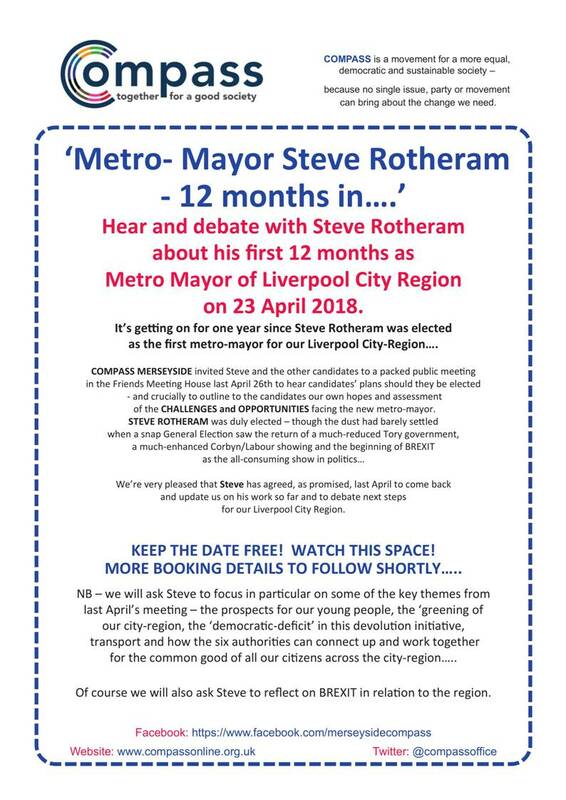 Liverpool City Region Metro Mayor - Economy Hustings - 30th March from 4.30pm-6.00pm at the Chamber of Commerce, Old Hall Street, organised by Centre for Cities and the Liverpool and Sefton Chamber of Commerce. On Thursday 30th March from 4.00pm until 6.00pm at the Rendall Building, University of Liverpool, Garrath Williams, Senior Lecturer in Philosophy from Lancaster University presents a lecture entitled 'Healthy food provision: stranded between corporate power and corporate powerlessness'. ​For more information on the event and to register, click here. On Sunday 26th March from 11.00am-4.00pm, 350.org and People & Planet are running a creative action and media training in Liverpool (venue TBC), ahead of the Global Divestment Mobilisation and local elections this May. The fossil fuel industry have been driving the climate crisis and delaying action on climate change for decades. For three years, the divestment campaign in the UK has been challenging the power of the fossil fuel industry, but now, in 2017, the stakes couldn’t be higher. Trainings are open to all, no matter your campaigning experience or involvement in divestment. If you have any questions get in touch with ellen@350.org. On Tuesday 21st March from 7.00pm to 9.00pm at the Eleanor Rathbone conference room at Blackburne House, Liverpool, CPRE Lancashire invites you to attend a meeting to discuss their Mayoral asks for strategic spatial planning and investment decisions impacting on our countryside and urban parkland. The meeting will enable CPRE Lancashire to explain recent work in the Liverpool City Region, such as local plan consultations, opposition to the development of land at a number of Liverpool Parks, and work with Nature Connected the Local Nature Partnership. On Tuesday 28th February at 9am at the Chamber, One Old Hall Street, the next Liverpool & Sefton Chambers of Commerce Energy & Environment Policy Forum will take place. The Energy & Environment Policy Forum provides Chamber Members with an opportunity to input on key policy issues, as well as benefitting from improved information sharing, communication and broader networking opportunities. Covering a wide range of issues of interest to all local businesses, not just those within the sector, the Forum is primarily for Chamber Members, however non Members are very welcome to attend the meetings as guests. For more information on Life with Art, click here. On Tuesday 24th January from 9.30am to 3.30pm the Forestry Commission hold the North West England Tree Health Update at the Liverpool Waters Marketing Suite, Princes Dock. For more information on the event, see the event flyer below. Liverpool Charity and Voluntary Services have made us aware of a Reaching Communities Masterclass being run by Community Action Wirral. The workshop takes place on Thursday 19th January from 10.00am-4.00pm at St James Centre, Egerton House, Tower Road, Birkenhead and is for Trustees and Staff of Community Organisations, Charities and Social Enterprises who are considering applying to the National Lottery's Reaching Communities Programme for revenue funding of over £10,000. For more information on the Masterclass, click here. On Tuesday 17th January from 12.00pm-2.00pm, Liverpool and Sefton Chamber of Commerce hold the next Chamber Green Lunch, joined by Paul Oldfield (Environmental & Biodiversity Manager) and Dr Peter Fitch (Environment and Contamination Adviser, Ramboll Consulting Engineers). They will discuss the Mersey Gateway Project, a major civil engineering scheme to build a new six-lane cable-stayed toll bridge over the River Mersey and a 9.2 kilometre road network connecting the new bridge to the main motorway network. The project will bring huge estimated benefits for people and businesses in Halton, the Liverpool city-region, Cheshire and across the north west including reduced travel times, inward investment and regeneration. A ‘green’ project, the Mersey Gateway is starting to bring major environmental benefits to the local area. A unique new charity – the Mersey Gateway Environmental Trust – has been created to promote the conservation, protection and improvement of the environment across a 1600 hectare area of the Upper Mersey Estuary running from the new bridge up river to Warrington. The Trust, which will also manage a new 28.5 hectare nature reserve alongside the bridge, is unique for a major construction project in the UK. For more information on the event, inlcuding how to register, click here. On Wednesday 14th December from 5.30pm-7.00pm at the Rendall Building, University of Liverpool, the Heseltine Institue for Public Policy and Practice present their latest seminar series talk. Entitled "Playing the (social) innovation game? Towards more playful urban regeneration in Liverpool", Matthew Thompson (a Postdoctoral student at the Heseltine Institute) will talk about a different kind of innovation in the Liverpool City Region and what that means for the local economy and social empowerment. For more information on booking your place at this event, click here. On Thursday 8th December from 1.30pm-4.00pm, Halton and St Helens Voluntary and Community Action are hosting a Meet the Funders Event. This event will give the opportunity to find out what is available to help support your voluntary, community, faith or social sector organisation. Various funders and support organisations will be exhibiting and there will also be opportunties for networking along with access to a variety of short 30 minute workshops. On Monday 14th November from 6.00pm at the Victoria Gallery and Museum, the Heseltine Institute for Public Policy and Practice present its latest Policy Provocations event. The event is entitled, "Shaping the City - What's the best way to provide a healthy food environment for our children to grow up in." ﻿For more information on this event and to register for tickets, click here﻿. On Thursday 10th November from 10.00am-6.00pm the Sheila McKechnie Foundation will host an Introduction to Campaigning Workshop in Liverpool at the FRC Group. The workshop provides the opportunity to find out how to develop a campaign strategy and identify the key tactics and skills needed to run an effective campaign, as well as the chance to meet other campaigners and develop your professional network. For more information on how to attend this event, click here. On Tuesday 1st November from 6pm, Tommorrow's Womens Wirral invite you to attend an Open Hour featuring a presentation and tour of one of their project. On Wednesday 26th October from 11.30am, Low Carbon Eco-Innovatory will host their launch event at the James Parsons Lower Lecture Theatre at Liverpool John Moores University. The essence of LCEI is to encourage research, innovation and knowledge transfer by offering direct access for local SMEs to Higher Education Institution facilities. LCEI provides access to cutting-edge exploitable assets and expertise and supports local SMEs on an individual basis to identify opportunities for low carbon development and reduction of greenhouse gas emissions, ultimately resulting in economic and environmental benefits for businesses and the community. Merseyside Civic Society has announced that their next open evening meeting will be held in the Quaker Meeting House at 6.30pm for 7pm start on Tuesday 18th October. The speaker will be Mike Eccles (Liverpool City Planning Department). Mike will be giving a short introduction to the new draft Liverpool Local Plan, which is currently out for consultation (see the City Council's web site for further details) followed by an extended opportunity for Q&As and discussion. Furthermore they have announced that their AGM will be in the same venue on Tuesday 22nd November. The speaker after the formal meeting will be Prof Phil Redmond CBE who is taking a leadership role in the new Cultural Partnership to make the city region the "cultural and creative powerhouse of the North. On Saturday 15th October from 9.30am-4.30pm Transition Liverpool present a symposium entitled 'Radical Shift: Building Sustainable Futures For A Devolved Liverpool City Region at the Friends Meeting House, School Lane. For more information, see the event flyer below. Throughout the year, Academics from across the University with research interests in the Third Sector will briefly and informally present their ideas, followed by a discussion to identify the key issues for the sector around each subject being examined. The topics to be covered include social value, social housing, health care and social welfare reform. On Thursday 15th September, Sefton CVS & Sefton4Good, in partnership with the Social Enterprise Network’s Liverpool Soup host Sefton SOUP at Southport Community Centre. 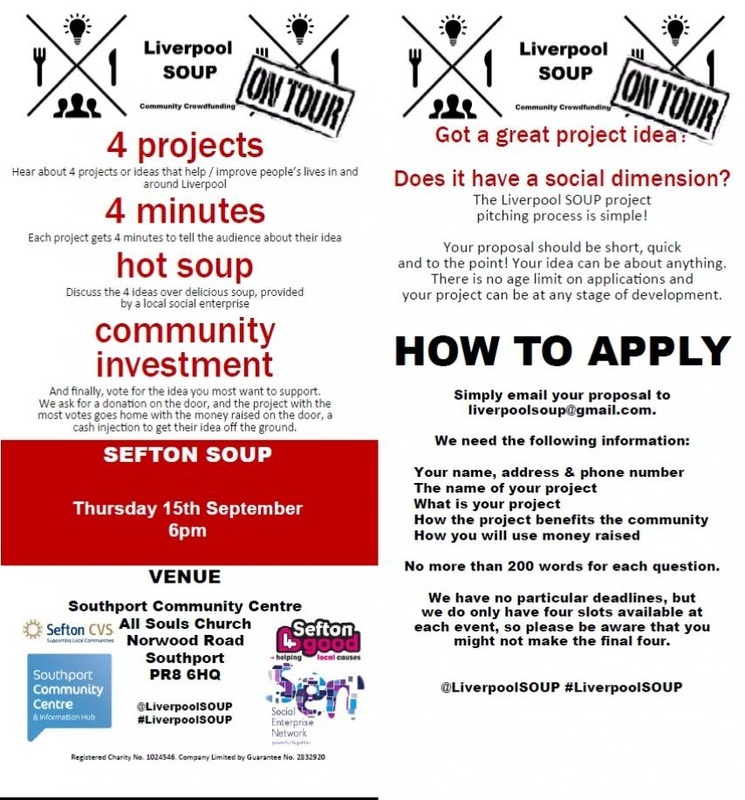 Sefton SOUP is a micro-grant event that supports new enterprise projects in the Liverpool City Region. If you’re an entrepreneur with an interest in social and community issues, come along and pitch your idea and you could walk away with enough money to start you off in business. For a small entrance fee, you get a ticket that allows you vote for the best pitch you hear that night. (and the all important bowl of soup, made fresh on the premises!) The winner of the most votes goes home with the profits from the ticket receipts. ﻿For more information, see the flyer below. For more information on the event and how to book tickets, click here. 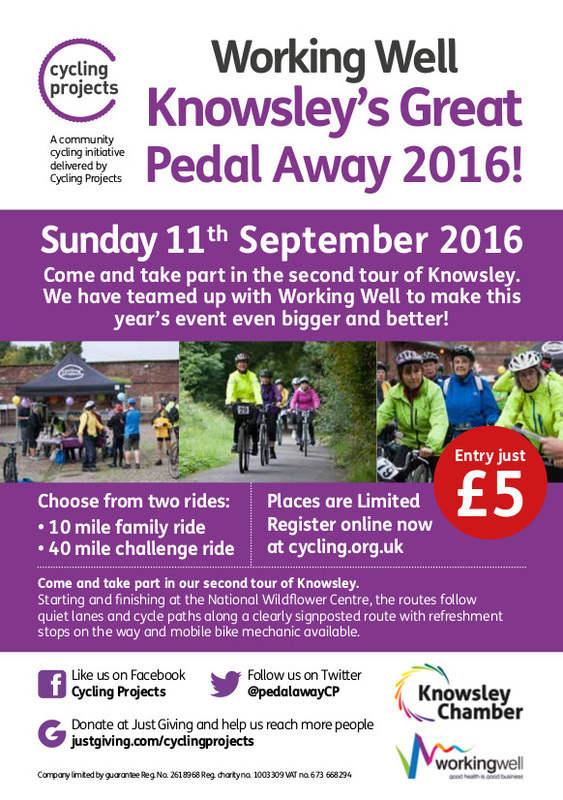 On Sunday 11th September Cycling Projects have teamed up with Working Well to bring you Knowsley's Great Pedal Away 2016. This year there is an option of a 10 mile Family Ride or a 40 mile Challenge Ride, with entry costing just £5. On Thursday 8th September from 10.30am to 3.30pm at the Botany Collections Store in the World Museum, Alison Evans of The British Pteridological Society is running an Introduction to Ferns Workshop that will feature learning about the ecology and identification of common British Ferns. 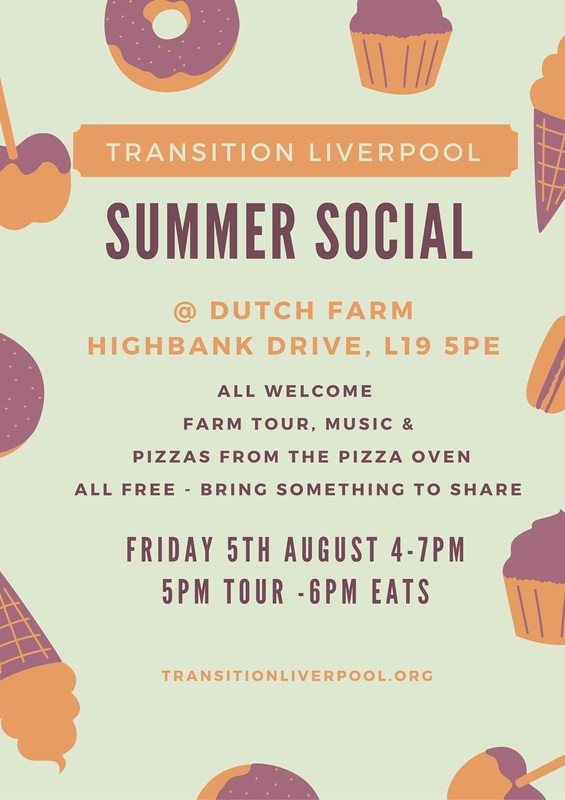 On Friday 5th August from 4pm at Dutch Farm in Garston, Transition Liverpool will hold their Summer Social. This event will feature a tour of Dutch Farm, music, and pizzas cooked in the farms pizza oven. On Saturday 18th July from 10.30am-5.00pm, Merseyside Civic Society present their contribution to National Civic Day with an event held at the Bluecoat. The main topic under discussion this year is "State of the City: Who Cares? We Care, Local people throughout Merseyside working for BIG change". This open event is free to attend for all. For the full programme of the day, see the event flyer below. On Friday 8th July, Community Action Wirral will be hosting a Reaching Communities Masterclass at St James Centre from 10.00am-4.00pm. The workshop is for Trustees and Staff of Community Organisations, Charities and Social Enterprises who are considering applying to the National Lottery’s Reaching Communities programme for revenue funding of over £10,000. For more information, including on how to book onto the workshop, click here. This Friday, 1st July at 9.00am (light breakfast served from 8.30am), Liverpool & Sefton Chambers of Commerce present an event entitled "Businesses who are doing well by doing good" at No 4 St Paul’s Square. The event will feature a range of partners including health@work, Social Value UK and Merseytravel, offering practical advice, support and general “tips” on how you can make your business more sustainable. The briefing will be part of the CBRE Enviro Live Day 2016, an annual event inviting local businesses to make positive improvements to our environment and achieve financial savings by raising awareness of green travel, energy saving and recycling. For more information, including on how to book onto the event, click here. On Wednesday 22nd June from 6.00pm-8.00pm at Ziferblat Albert Dock a free event that is part of The Edge IFB2016 entitled "In/out of the EU – What is the future of sustainable, efficient energy generation and storage for Liverpool?" will take place. Chris Laughton (MD of The Solar Design Company) will give his opinion on the future of sustainable, efficient energy generation and storage and the scenarios both in and out of the EU. An audience discussion will follow. ﻿For more information, click here﻿. On Wednesday 22nd June from 5.30pm-7.30pm at Exchange Station, Tithebarn Street, The Engage Annual Conference (part of The Edge IFB2016) on the theme of Biophilic Design will take place under the title "Designing with Nature". 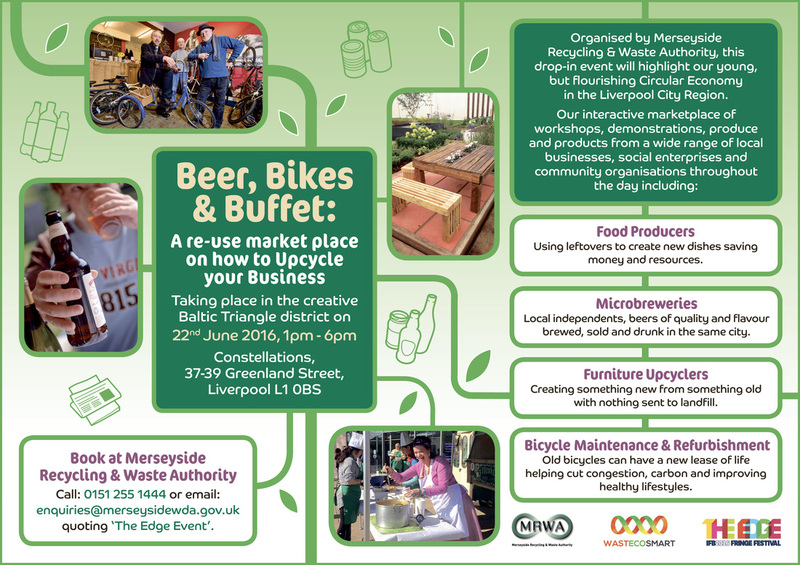 On Wednesday 22nd June from 1.00pm-6.00pm at Constellations on Greenland Street, Merseyside Recycling & Waste Authority will hold an International Festival of Business Edge Event entitled "Beer, Bikes and Buffet: A re-use market place on how to Upcycle your Business." The interactive marketplace will include workshops, demonstrations, produce and products from a wide range of local businesses, social enterprises and community organisations. Resilient Liverpool Event - Liverpool City Council has commissioned CLASP (the Climate Change Local Area Support Programme) to deliver an Edge Event in conjunction with the International Federation of Business (IFB) on 21st June. The two free sessions will focus on business resilience in face of climate change and the impact of severe weather events to SMEs. This workshop will look at risks like this, and help small – medium businesses become more resilient to the climate risks they face both now and in the future. This can help differentiate you from competitors, and continue operation in the face of disruption such as flooding, storms, heatwaves and snow. At the end of the workshop all participants will know how to access and use an online Resilience Health-check tool, and will have generated a report and action points for their own organisation. For more information on how to register for the event, click here. On Saturday 11th June, Merseyside Civic Society present "A Pre History Mystery Tour" with Ron Cowell (Archaeology, Museum of Liverpool). In the morning, the tour will follow the line of the river Alt, one of the most important thoroughfares in local prehistory, ending at one site where a hunting camp and its wetland landscape still exist. In the afternoon, the tour will follow the landscapes and sites of the early farmers after 4000BC, ending at the site of a modern farm that goes back to before Roman times. On Wednesday 8th June, Merseyside Civic Society will host an open presentation and discussion on a Manifesto and set of Proposals for a Campaign to establish a Liverpool Architecture Biennial. The meeting will take place at 6pm at The Redmond Building on Brownlow Hill. On Wednesday 1st June from 6.30-8.30pm at Quaker Meeting House on School Lane, a Ditch Coal Tour Event will take place. Through this event you will discover the impacts of mining coal to feed UK power stations and about the resistance to these mines and UK coal infrastructure. Liverpool port imported 1.38 million tonnes in the months between September 2014 and April 2015, the majority of this was from Russia, the rest from the USA. Come along to find out more and how discuss how together coal's journey of destruction can be ended. On Wednesday 1st June at 6pm, The Duncan Society in collaboration with the Department of Public Health and Policy at University of Liverpool present the 29th Duncan Memorial Lecture. The lecture, entitled "What are the best investments for health equity across the lifecourse?" will be delivered by Professor John Frank (Director Scottish Collaboration for Public Health Research and Policy, University of Edinburgh) and will take place at the Leggate Lecture Theatre, Victoria Gallery and Museum. The second Heseltine Institute seminar of the year will take place on Tuesday 31st May. The seminar will centre around the screening of a short film by local artist Jayne Lawless about the experience of compulsory purchase and demolition of homes in a ‘pathfinder’ neighbourhood. On Wednesday 11th May, the Liverpool European Law Unit is hosting a public question and answer session featuring EU law experts, on the EU referendum. It takes place at 6pm in the Black-E community centre, Great George Street, L1 5EW (next to the Chinese Arch). On Saturday 7th May from 10.00am-4.00pm, the Sustrans Volunteer Wildlife Champion Conference is taking place at the Wildflower Centre in Liverpool. The aim of the day is to inform and enthuse volunteers across the North West to get out and about this summer and do some practical conservation and wildlife surveys on the National Cycle Network as part of the Greener Greenways project. Immediately following the Easter break, Fauna & Flora International North West Group will host two events during April on carnivores at Chester Zoo. First, on Friday April 1st, Greg Rasmussen will hold a talk about painted dog conservation. Then on Friday 22nd April, Cyril Stannard will talk about the work of the Cheetah Outreach Trust. Both events will take place at Chester Zoo’s Russell Allen Lecture Hall with doors opening at 7.00pm for a 7.30pm start. Tickets cost £9 for FFI Members, £10 for non-Members, with a concession of £5 for students. All prices include a buffet and wine. Tickets may be available on the door but advanced booking helps keep costs down and guarantees a seat. 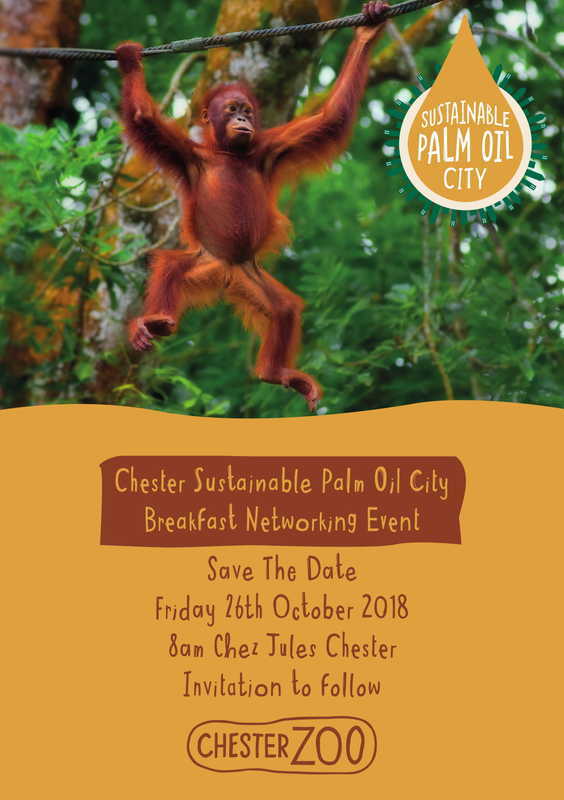 To reserve tickets email or call Penny Rudd using pennyr@chesterzoo.org or 01244 650215. On Tuesday 19th April, Merseyside Civic Society present a meeting entitled 'W(h)ither Parks and Open Spaces? Current Issues and New Approaches in the City Region' including two short presentations by Simon O'Brien and Professor Robert Lee OBE at Liverpool Central Library from 5.30pm. On Wednesday 23rd March, from 9.30am-4.30pm Liverpool Charity and Voluntary Services will be holding its Big Event at The Florrie, 377 Mill Street. This event will be a day of free bitesize information sessions and training workshops on current policy, fundraising, governance, volunteering and other topics relevant to staff and trustees of voluntary sector organisations. For more information, including on how to book your place, see the event flyer below. On Tuesday 15th March from 10.00am-12.00pm Community Action Wirral present a HMRC Workshop with Neil Petterson (HMRC Officer from HMRC Bootle). Neil will be presenting a session on all the issues that affect the not for profit sector that HMRC deal with including Gift Aid, Community Amateur Sports Club, VAT, Payroll Giving and Corporation Tax. For more information, including on how to RSVP for the event, click here. Transition Liverpool host a monthly 'Transition Café' where discussions take place on a variety of Transition issues in a relaxed and informal way. On Wednesday 9th March from 6.30-8.30pm at Quaker Meeting House in Liverpool, attention will turn to Local Food Producers and Outlets. There are a range of outlets locally that sell sustainably sourced food as well as produce from local growers. Transition Liverpool invites you to come and share your wealth and passion about seeing our local food economy thrive. Please contact transitionliverpool@gmail.com if you'd like to present about your project. On Friday 26th February, Fauna & Flora International North West Group present a talk 'She Sells Seafood on the Seashore: Voices from the Front Line of Marine Conservation' from 7.00pm at Chester Zoo’s Russell Allen Lecture Hall. Martin Muir is part of Blue Ventures' (who work with the worlds poorest coastal communities to rebuild tropical fisheries and catalyse a broader engagement in marine conservation) UK based management team, responsible for managing their global communications and digital activities. The talk will features Martin's experiences on conservation projects all over the world including research stints in his native Scotland, Indonesian Borneo, Gambia and living for a year with the Payamino community remote in the amazon rainforest of Ecuador. Community Action Wirral are hosting an EU Procurement Workshop with Specialist procurement lawyers, Richard Hough and Michael Winder from Brabners. Between them, Richard and Michael, who are members of the Procurement Lawyers’ Association, have significant experience of advising clients on a wide variety of public procurement law issues. The workshop will take place from 2pm - 4pm on Thursday 25th February at 47-48 Hamilton Square, Birkenhead, CH41 5AR. For more information on what the workshop will cover and how to book your place onto the event, click here. On Tuesday 16th February from 5.30pm, Merseyside Civic Society host an event 'Tranmere Deep Underground Air Raid Shelter', presented by Ian Weir (Conservation Accredited Engineer) at Liverpool Central Library. Ian Weir is the Project Manager and Conservation Engineer who has led recent investigations into the presence, extent and condition of the Birkenhead tunnels, built for Cammell Lairds’ workforce at the beginning of WWII. Ian will report on the findings so far which have been undertaken on behalf of Tranmere Tunnels Volunteers Ltd, with grant assistance from the Heritage Lottery Fund. On Friday 29th January, Fauna & Flora International North West Group present a talk 'Sumatran Tigers: Heartbreak and Hope in the Rainforest' from 7.00pm at Chester Zoo’s Russell Allen Lecture Hall. Olivia Walter is the Development Manager at Wildlife Vets International and Tigers and Amur Leopards have featured throughout her career. The talk will look into how her experiences of the conservation puzzle fit into the bigger picture. For more information, see the even flyer below. 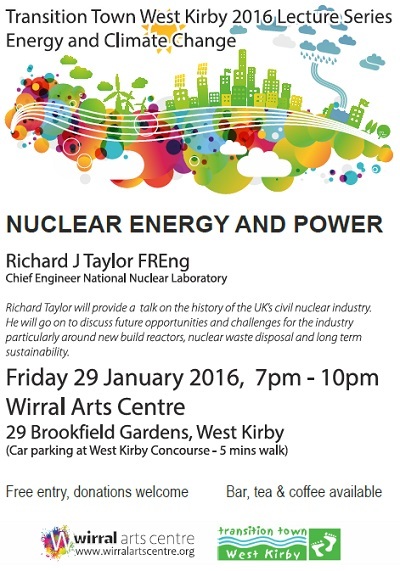 This Friday Transition Town West Kirby present a talk on Nuclear Energy and Power as part of their 2016 Lecture Series on Energy and Climate Change. The talk will take place at the Wirral Arts Centre, 29 Brookfield Gardens from 7pm-10pm and is free to enter. Richard Taylor, Chief Engineer at the National Nuclear Laboratory will provide the talk. This event will be led by Jon Develing, Chief Accountable Office of Wirral CCG and is a not-to-be-missed opportunity to help shape how the voluntary sector can contribute to create a healthier Wirral, over the next 12 months. Please let Healthy Wirral know you’ll be coming by emailing: healthy.wirral@nhs.net or you can RSVP via the following link. You may recall that Simon O’Brien, Chair of the Green & Open Spaces Review released his Interim Report to the public on Tuesday 8th December 2015. (The report can be found on the Strategic Green & Open Spaces Review Liverpool page on the LCC website). The whole Review proved to be more challenging than first expected but resulted in a large scope of work being thoroughly investigated and deliberated upon by the Chair and its Board members. The Chair felt it necessary to hold three further public consultation meetings with the final one of these taking place next Thursday 28th January at The Black E, Chinese Arch, City Centre from 5.00pm until 8.00pm. On Friday 22nd January, 10am-2pm Community Action Wirral present a Small Grants Masterclass with funding consultant Peter Riley. Attend the workshop with your small grants application drafted and end the day potentially ready to submit your application to the funder. Small Grants funders discussed on the day will include Awards for All, Sport England’s Small Grants, Heritage Lottery’s Sharing Heritage, Esmee Fairbairn Foundation, Morgan Foundation and Children in Need. Peter has over 32 years’ Local Government experience working within various Departments including Leisure Services, Planning and Economic Development and latterly Regeneration. He has assisted hundreds of groups and organisations in successfully applying for National Lottery funding – with grant successes totalling over £26 Million. For more information, including how to book onto the workshop, please visit the dedicated page. On Tuesday 19th January from 5.30pm, Merseyside Civic Society present an event 'Neighbourhood Planning: Communities, Networks and Governance' chaired by Dr Olivier Sykes at Liverpool Central Library. Key speakers will give brief presentations (Eddy Taylor [MRTPI] : recent and proposed relevant changes to planning legislation which are important for Neighbourhood Planning; Dave Chetwyn [Urban Vision Enterprise CIC] : culture change for planning; assessing housing need; issues around general conformity; and, strategic planning implications) before a panel discussion featuring representatives of organisations involved in the development of neighbourhood plans from across the Liverpool City Region. The panel will include the speakers plus Jean Grant (L8 Neighbourhood Plan), Eileen Wilshaw (Wirral MBC), Andrew Morris (Love Canning) and Gerry Proctor (Engage Liverpool). On Thursday 14th January, 1.00pm-4.00pm, Love Food Hate Waste (in association with Groundwork) present an event at the Liverpool Guild of Students. At this free, fun and interactive session there will be tips on how to save up to £60 a month on food and ideas of how to spread this message amongst family, friends and the local community. For more information, including how to book, see the event flyer below. On Wednesday 13th January from 2.00pm-5.00pm, Liverpool City Council and the Liverpool City Region Local Enterprise Partnership present a Public Workshop held in the Cunard Building asking 'What next for Community Energy and Local Generation?' The event will begin with a number of presentations to set the scene and look at good practice elsewhere, before breaking out into a workshop format to consider local solutions and funding opportunities. Anyone with an interest in the topic of sustainable energy is invited to attend this public workshop to discuss the future of local energy generation. For more information and to register for the event, visit the Eventbrite page. On Monday 14th December, Knowsley Community and Voluntary Service hold their workshop Social Value Boot Camp from 9.30am-4.00pm at St Gabriel's Church in Huyton. The Social Value Boot Camp is a workshop designed to support charities, social enterprises and the wider voluntary sector in understanding their social value and impact on service users and the wider community. This session will provide a range of practical frameworks, tools and techniques to support working within the social value framework. It will be very interactive and give you chance to work on the real social value and impact of your organisation. For more information, including how to book your free ticket, visit the Eventbrite page. 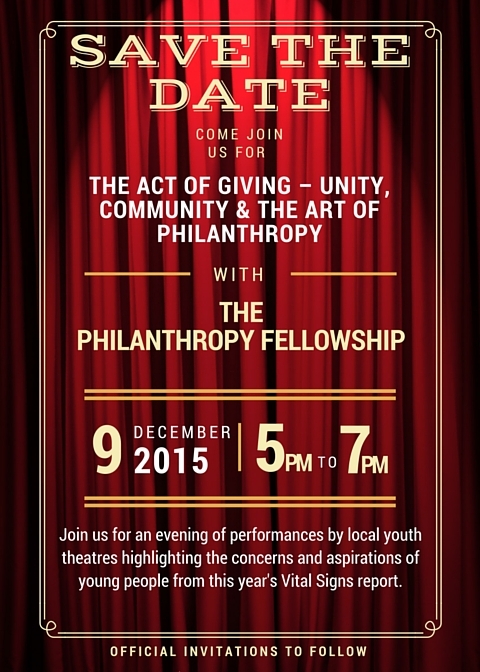 On Wednesday 9th December, The Philanthropy Fellowship present an event, 'The Art Of Giving - Unity, Community & The Art Of Philanthropy' from 5.00pm-7.00pm at the Unity Theatre. The evening will include performances by local youth theatres highlighting the concerns and aspirations of young people from this years Vital Signs report. Official invitations will be sent out at the end of the month but for more information please email michaela.bromilow@cflm.email or see the event flyer below. This Friday and Saturday marks the L8 Winter Market Weekender. On Friday, 3.30pm-6.30pm, Squash Nutrition brings the Winter Night Garden Market at the Grapes Community Food Garden on Windsor Street (next door to Toxteth TV). 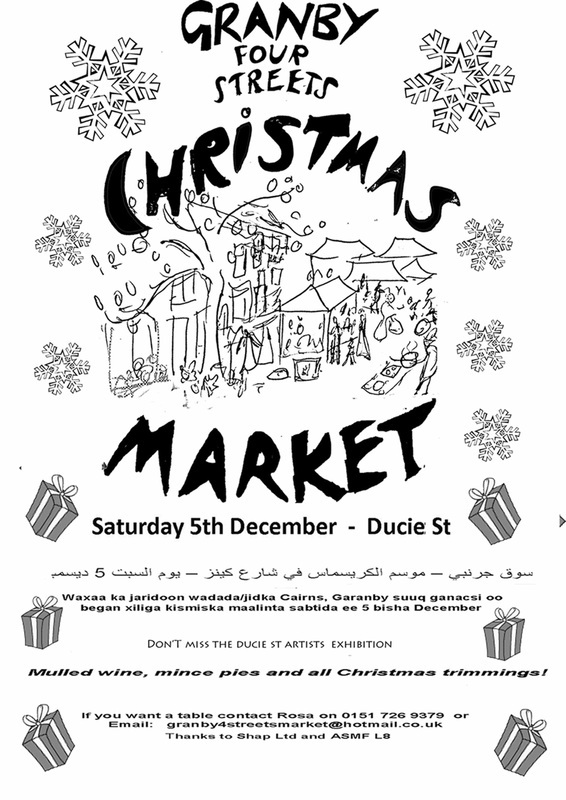 On Saturday, 10am-3pm, the Granby 4 Streets presents its Christmas Market on Ducie St. For more information see the two event flyers below. On Wednesday 2nd December, Halton & St Helens Voluntary & Community Action present their Annual General Meeting and Day of Discovery Conference from 9.15am-1.00pm at St Maries, Lugsdale Road, Widnes, Cheshire, WA8 6DB. This conference has been designed to the delegate the opportunity to find out what is available to help support the future of your voluntary, community, faith or social sector organisation. Various funders and support organisations will be exhibiting and there will also be opportunities for networking along with access to a variety of short 30 minute workshops. From Friday 27th to Sunday 29th November, the Sheila McKechnie presents its Annual Campaigners Residential. Held at Trafford Hall in Chester, the weekend is an intensive learning and development experience for campaigners who are looking to expand their campaigning skills, receive individual advice on their campaign strategy and test their ideas with other campaigners working across different thematic areas. The training weekend will support you in the process of building a solid and realistic campaign strategy and plan for action, through exciting and hands-on sessions with highly skilled trainers! For much more information, including how to book onto the workshop, please visit the dedicated page. On Friday 27th November, 10am-2pm Community Action Wirral present a Small Grants Masterclass with funding consultant Peter Riley. Attend the workshop with your small grants application drafted and end the day potentially ready to submit your application to the funder. Small Grants funders discussed on the day will include Awards for All, Sport England’s Small Grants, Heritage Lottery’s Sharing Heritage, Esmee Fairbairn Foundation, Morgan Foundation and Children in Need. Peter has over 32 years’ Local Government experience working within various Departments including Leisure Services, Planning and Economic Development and latterly Regeneration. He has assisted hundreds of groups and organisations in successfully applying for National Lottery funding – with grant successes totalling over £26 Million. On 26th November you are invited to come along to the Floral Pavilion in New Brighton and help shape a new, Healthy Wirral. There will be lots to see and do including health checks and chats, pamper sessions, finding out what’s on in your community, and most importantly: giving you the chance to shape a happier, healthier Wirral, right from the very start. On Friday 20th November, Fauna & Flora International North West Group present a talk ‘Nest sites and knuckle prints: searching for Congo’s forgotten gorillas’ from 7.00pm at Chester Zoo’s Russell Allen Lecture Hall. Stuart Nixon, Chester Zoo's Africa Field Programme coordinator will talk us through his experiences and adventures from over a decade of field research in Central Africa. For more information, see he event flyer below. 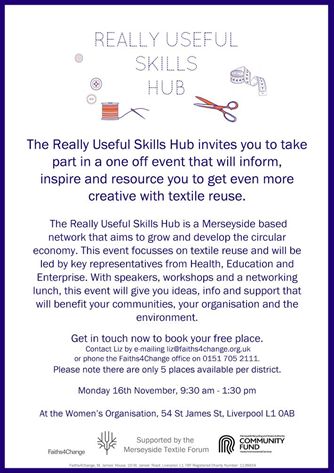 On Monday 16th November, 9.30am-1.30pm The Really Useful Skills Hub invites you to an event based upon creative textile reuse at the Women's Organisation, 54 St James Street, Liverpool, L10AB. The Really Useful Skills Hub is a Merseyside based network that aims to grow and develop the circular economy. This one of event will inform, inspire and resource you to get even more creative with textile reuse. For more information including details on how to book your place see the event flyer below. On Wednesday 11th November, NCVO in association with Understanding Society and Cooperative Councils Innovation Network present an event 'The State of Social Capital in Britain' at NCVO Headquarters in London as part of the ESRC Festival of Social Science Week (7th-14th November). The high profile event will be used as a platform to discuss policy, evidence and pioneering initiatives on building social capital through civic participation and social connections. On Wednesday 11th November, Liverpool Green Party present two Public Meetings at The Friends Meeting House, 22 School Lane, L1 3BT. 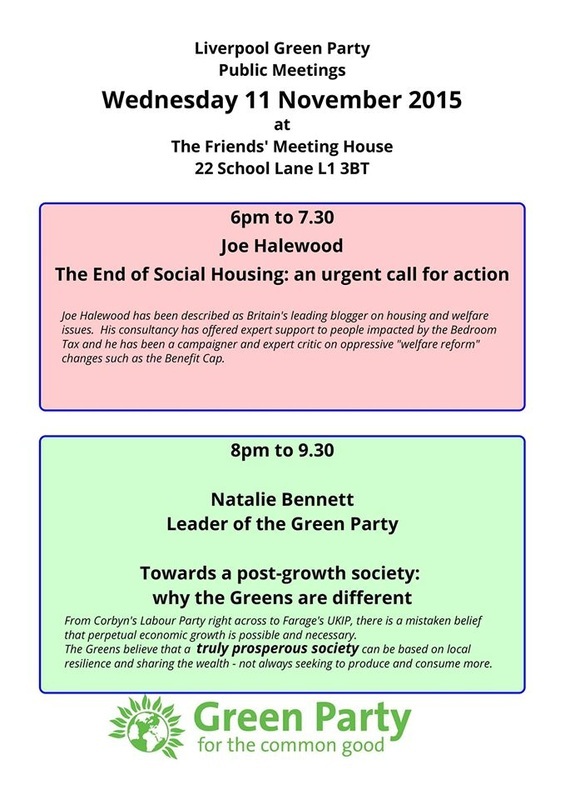 From 6.00pm-7.30pm, consultant and campaigner Joe Halewood will hold a talk entitled 'The End of Social Housing: an urgent call for action.' Then, from 8.00pm-9.30pm, Leader of the Green Party Natalie Bennett will hold a talk 'Towards a post-growth society: why the Greens are different. On Tuesday 27th October, Growing Health, Alder Hey Children's Hospital and The Academy of St Francis of Assisi will host "Growing in the Community, a natural part of the heath service." This event is a conference for healthcare professionals, health commissioners and gardening projects held at the Academy of St Francis of Assisi. On Saturday 24th October, Chester Zoo presents its Annual Conservation Symposium 'Labelling Sustainability' from 10.15am-5.00pm at Chester Zoo's Lecture Theatre. At the event, discussions will take place surrounding whether sustainability labelling can really help wildlife and what more we and the food industry could do to protect the planet. This event is perfect for anyone interested in wildlife conservation or sustainable food. On Friday 23rd October, Flora and Fauna International North West Group present a talk 'Conserving Columbia's Tiniest Primate' from 7.00pm at Chester Zoo's Russell Allen Lecture Hall. Greg Clifton will talk about two of the worlds most endangered species, the cotton-top tamarin and white-footed tamarin and the dangers and struggles they face on a daily basis. On Friday 23rd October, Love Food Hate Waste are hosting an event 'The Big Freeze' on Liverpool's Church Street from 9am-4pm. The free and fun Big Freeze event will have interactive games, giveaways and competitions - all designed to help people make the most of their freezer and enjoy mouth-watering meals made by mixing and matching fresh and frozen food. For more information, see the event flyer below, or visit The Big Freeze event page. On Thursday 22nd October, the Institute of Directors present the Liverpool Renewable Energy Sector Forum from 5.30pm-8.30pm at Unit 51 Baltic Creative Campus. The Forum will ask 'What can the IOD do to support the renewable/sustainable energy sector businesses?' Hosted by Stuart McBain we will hear first from Chris Laughton, Managing Director of The Solar Design Company who will facilitate a discussion about the issues in this sector. We will also hear from Pete Radcliffe, Chair of IoD Liverpool. For more information including how to book onto the event, visit the IoD event page. 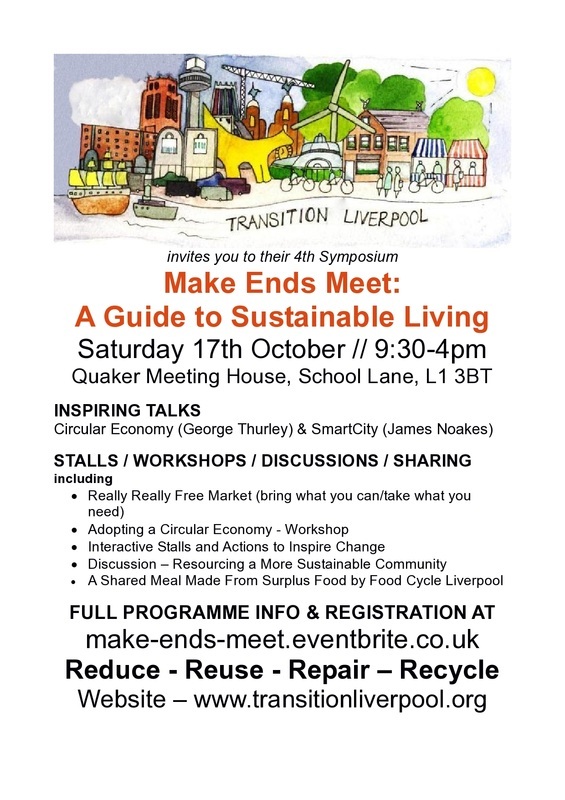 On Saturday 17th October, Transition Liverpool are hosting an event 'Make Ends Meet: A Guide to Sustainable Living' at Quaker Meeting House, School Lane from 9.30am-4pm. The day will consist of talks, stalls, workshops, a shared meal cooked from surplus food by Food Cycle Liverpool, a Really Really Free Market (where you are invited to bring what you can and take what you need) and a discussion about how we can resource our communities with the tools needed to create a sustainable and restorative approach to living. For more information, see the event flyer below, or visit the Transition Liverpool page. On Friday 16th October, Train the Trainer presents a free workshop 'Growing spaces, growing people: community food growing in action' from 10.00am-12.30pm at St Michaels in the City Church, Liverpool. At the event, expert trainer and gardening tutor Jenny Griggs will lead an interactive session including food growing workshop ideas, session and lesson plans, funding ideas and much more. This Thursday, Family Refugee Support Project (FRSP) invite you to their open day at the FRSP New Land Garden from 1.00pm-3.00pm. The garden represents a great example of how horticulture can help to heal and the day will be filled with enjoyment of the garden with plenty of drinks and cake to go round. Presentation by Prof. Erik Bichard (University of Salford) entitled “Placing a value on social and environmental change: The SuROI approach to city assets and programmes”. For more information, see the event flyer, which also includes details of upcoming MCS events including the next AGM. 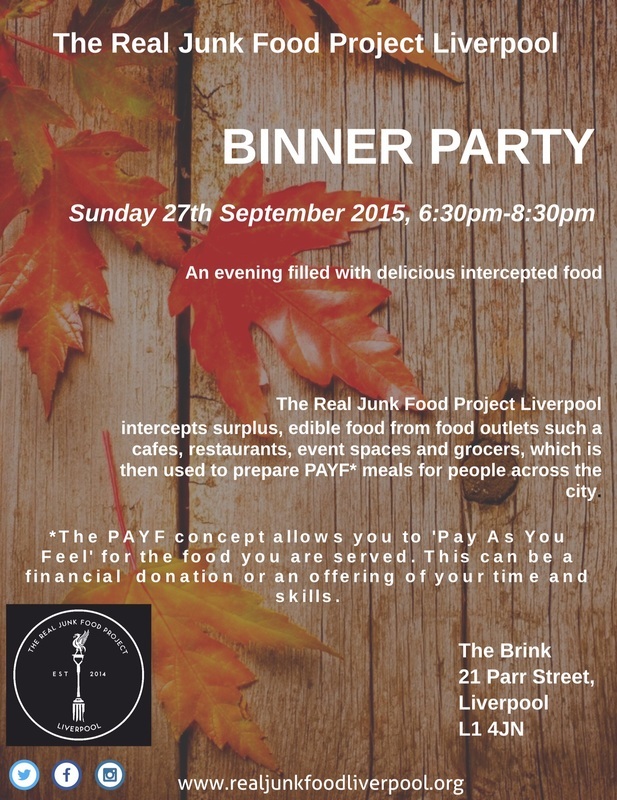 This Sunday, from 6.30pm-8.30pm, Real Junk Food Project Liverpool invite you to their event 'Binner Party' at The Brink, 21 Parr Street, Liverpool, where surplus food is used for good! For more information see the event flyer below or visit the Real Junk Food Liverpool website.